U.S. Air Force Tech. Sgt. 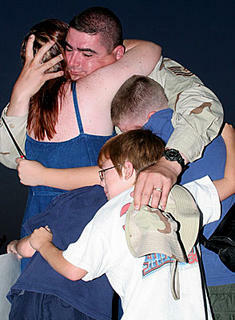 Rick Bouwhuis, 37th Security Forces Squadron, Lackland Air Force Base, Texas, is embraced by his wife and two sons upon his return from an eight-month deployment to Iraq, July 10, 2005. Complements of DoD. USAF photo by Robbin Cresswell. Who’s at war- The American people or the Military by itself??? Now-- Many of you might disagree with me but I for one like President Pervez Musharraf. This article at: BBC NEWS is a good example of the man and his own personal war on terror. You got to give it to the man… He has been the target of several assassination attacks within his own country and every day has to walk a fine line between helping the west and appeasing his fellow countrymen. Oh yes… Musharraf most certainly has a drum bet of his own, with this war on terror and his words are so often unheard by the west. We just don’t listen… Figure that!!! I also think that no man, or women, can change the thinking of an entire country over night. President Pervez Musharraf is most certainly no different. I’ll end by saying President Musharraf surely has his hands full, but at least to me, he seems to be trying to do his best under the circumstances. Pvt. Ernesto R. Guerra, 20, of Long Beach, Calif. , died July 29 in Baghdad, Iraq, of injuries sustained on July 28 in Baghdad, Iraq, when his HMMWV was involved in an accident. Guerra was assigned to the Army's 4-3rd Brigade Troops Battalion, 3rd Infantry Division, Fort Stewart, Ga.
Spc. Edward L. Myers, 21, of St. Joseph, Mo. , died July 27 in Samarra, Iraq, where his unit was conducting patrol operations and an improvised explosive device detonated near his HMMWV. Myers was assigned to the Army's 3rd Battalion, 69th Armor Regiment, 3rd Infantry Division, Fort Stewart, Ga.
Lance Cpl. Christopher P. Lyons, 24, of Shelby, Ohio, died July 28 when his unit came under attack by enemy small-arms fire and rocket-propelled grenades while conducting combat operations in Cykla, Iraq. He was assigned to the Marine Reserve's 3rd Battalion, 25th Marine Regiment, 4th Marine Division, Columbus, Ohio. During Operation Iraqi Freedom, his unit was attached to Regimental Combat Team-2, 2nd Marine Division, II Marine Expeditionary Force. Media with questions about this Marine can call the Marine Forces Reserve Public Affairs Office at (504) 678-4178. 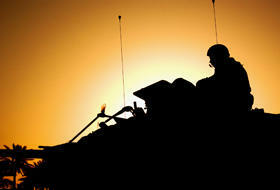 The Department of Defense announced today the death of four soldiers who were supporting Operation Iraqi Freedom. They died on July 24, in Baghdad, Iraq, where an improvised explosive device detonated near their HMMWV while they were on patrol. The soldiers were assigned to the Army National Guard's 2nd Battalion, 121st Infantry Regiment, 48th Infantry Brigade, Albany, Ga.
Spc. Jacques E. Brunson, 30, of Americus, Ga.
Staff Sgt. Carl R. Fuller, 44, of Covington, Ga.
Sgt. James O. Kinlow, 35, of Thomson, Ga.
Sgt. John F. Thomas, 33, of Valdosta, Ga.
“American service members have died protecting the rights of Muslims in Kuwait, Bosnia and Kosovo… Terrorists have embraced the ideology of violent extremism by their own choice… No one is making them do it…They're doing it because they want to create chaos and to undermine our way to life." 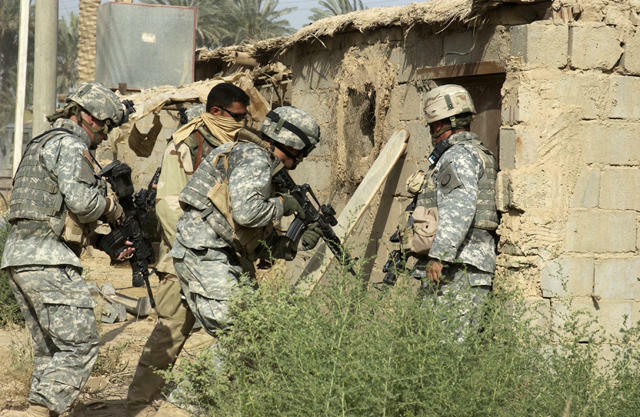 U.S. Army Soldiers from the 2nd Battalion, 130th Infantry Regiment, 256th Brigade Combat Team, enter a house in search of four insurgents that earlier attacked Iraqi Army Soldiers. The team is conducting a cordon-and-search mission with the Iraqi Army in Baghdad, Iraq. Cpl. Andre L. Williams, 23, of Galloway, Ohio, died July 28, when his unit came under attack by enemy small-arms fire and rocket-propelled grenades while conducting combat operations in Cykla Village, Iraq. He was assigned to Marine Forces Reserve's 3rd Battalion, 25th Marine Regiment, 4th Marine Division, Columbus, Ohio. During Operation Iraqi Freedom, his unit was attached to Regimental Combat Team-2, 2nd Marine Division, II Marine Expeditionary Force. Capt. Benjamin D. Jansky, 28, of Oshkosh, Wis. , died July 27 in Al Taqaddum, Iraq, where his HMMWV was accidentally struck by another military vehicle. Janksy was assigned to the Army Reserve's 983rd Engineer Battalion, Monclova, Ohio. 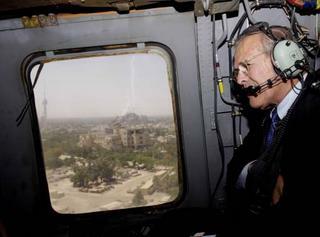 Secretary of Defense Donald H. Rumsfeld looks over Iraq from an HH-60 Pavehawk helicopter on July 27, 2005. Rumsfeld met with senior Iraqi and U.S. officials during an unannounced visit to Baghdad, Iraq, where he urged Iraqis to finish their draft constitution. DoD photo by Tech. Sgt. Kevin J. Gruenwald, USAF. How about a little slideshow I did on Sec Rumsfeld called: "All them Faces- Sec Rumsfeld"... DSL/Cable internet connection works best for this slide. Hope you enjoy!!! Click here to view-- RUMMY. Afghan and U. S. forces killed three insurgents and captured 15 others in combat west of Tarin Kowt in Afghanistan's Oruzgan province today, U. S. military officials reported. Two Afghan soldiers suffered minor injuries in the firefight and were transported to a nearby military base for treatment, officials said. Afghan and U. S. forces returned fire when their joint patrol was hit by small-arms fire from an unknown number of enemy combatants. They are searching the area for more enemy forces. Coalition attack aircraft responded to the scene and provided close air support. 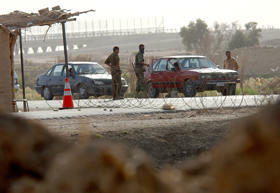 "This incident occurred in the same area where we are presently building a road for the Afghan people, a road that will become an artery for commerce," said U. S. Army Lt. Col. Jerry O'Hara, spokesman for Combined Joint Task Force 76. "This enemy is only concerned about killing and has no concern for the well-being of the Afghan people. Those who chose to stand against the government of Afghanistan, in the wake of the government's offer of reconciliation, do so at considerable risk. " Afghan and U. S. forces were conducting operations to deny the enemy safe havens in the area of the attack. Officials are questioning the 15 individuals detained. Above taken from DoD: American Forces Press Service Release. An Iraqi Army Soldier conducts a thorough search and identification check of all vehicles at a tactical control point during Operation Scimitar near Al-Radwnea, Iraq on July 12, 2005. 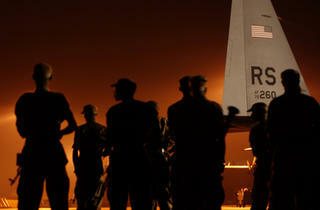 U.S. Air Force photo by Staff Sgt. Reynaldo Ramon. Complements of Multi-National Force-Iraq. Like here at home- Iraq too needs to talk Border Issues with its neighbors. Iraq needs to step up its efforts to communicate with its neighbors and come up with some plan to stop these foreign terrorist from coming over the boarders and causing so much havoc and death in Iraq. Iraq, Iran and Syria have been talking of late but I’m afraid that’s about all that’s going to come out of it-- TALK... It’s time for all sides to get down and do more than just talking and getting face time from their local Press. Like how about taking some action on the issues at hand-- that would be a good starter!!! Not to much longer from now Iraq will be able to stand up on its on two feet and police its on country. If by then Iran, but mostly Syria, can not find it within themselves to take care of their responsibilities to the world community we the US and whom ever else we can get to help, will most likely have to go over those boarders and do a little house cleaning. We as a country and the World Community as a whole can no longer let these countries harbor and finance these terrorist as we have been doing so for the last few years. President Bush himself needs to back up his on words, ("Over time it's going to be important for nations to know they will be held accountable for inactivity…You're either with us or against us in the fight against terror.") and start getting this war on behind us. What say you??? Defense Department's relationship with the scouts is long-standing and enduring. terrible accident, and with the Boy Scouts of America at this time of loss. Staff Sgt. Michael W. Schafer, 25, of Spring Hill, Fla. , died July 25 in Oruzgan, Afghanistan, when he was shot by enemy forces while on a quick reaction force mission. Schafer was assigned to the 2nd Battalion, 503rd Infantry Regiment, Vicenza, Italy. Spc. Adam J. Harting, 21, of Portage, Ind. , died July 25 in Samarra, Iraq, when an improvised explosive device detonated near his Bradley Fighting Vehicle. Harting was assigned to the 3rd Battalion, 69th Armor Regiment, 1st Brigade Combat Team, 42nd Infantry Division, Fort Stewart, Ga.
Sgt. Christopher J. Taylor, 22, of Opelika, Ala. , died July 24 in Balad, Iraq, when he was hit by mortar rounds while he was exiting a bunker. Taylor was assigned to the 1st Battalion, 41st Field Artillery, 1st Brigade Combat Team, 3rd Infantry Division, Fort Stewart, Ga.
DoD (DPMO) Identifies U. S. servicemen, missing in action from the Vietnam War. The Department of Defense POW/Missing Personnel Office (DPMO) announced today the remains of two servicemen, missing in action from the Vietnam War, have been identified and are being returned to their families for burial with full military honors. both Air Force. Lewis is to be buried in Marshall on August 13, and Baker is to be buried in Longview, Texas on July 29. On April 7, 1965, Lewis and Baker led a flight of four B-57B Canberra aircraft on an interdiction mission over Xiangkhoang Province, Laos. After their B-57 initiated an attack run into heavy clouds, Lewis radioed his plane was outbound away from the target. There was no further radio or visual contact with the crew, and search and rescue missions failed to yield any evidence of the two men or their aircraft. Although the cause of the crash is unknown, enemy fire and bad weather are believed to be contributing factors. In July 1997, a joint U.S.-Lao People’s Democratic Republic team interviewed several witnesses, two of whom led the team to the crash site. Four excavations led by the Joint POW/MIA Accounting Command (JPAC) from 2003 to 2004 yielded human remains and crew-related artifacts. JPAC and Armed Forces DNA Identification Lab scientists used mitochondrial DNA to identify the remains as those of Lewis and Baker. Of the 88,000 Americans missing from all conflicts, 1,827 are from the Vietnam War, with 372 of those within the country of Laos. Another 756 Americans have been accounted for in Southeast Asia since the end of the Vietnam War. Of the Americans identified, 197 are from losses in Laos. 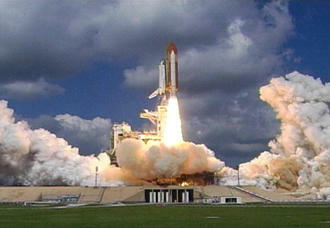 Good read and launch video at: NASA.gov. Most Headlines say Algeria pulls out last diplomat from Iraq – AubreyJ says NO… They like Spain and others just CUT and RAN from their obligations to the world and this war on terror!!!! When will these people understand that this is not just a U.S.A. war… It is the WORLD’S WAR and it’s most likely coming to a neighborhood near them very soon too!!! Sgt. Jason T. Palmerton, 25, of Auburn, Neb. , died on July 23 in Qal'eh-Yegaz, Afghanistan, where he came under enemy small arms fire while conducting a dismounted patrol. Palmerton was assigned to 1st Battalion, 3rd Special Forces Group (Airborne), Fort Bragg, N. C.
Sgt. Bryan J. Opskar, 32, of Princeton, Minn. , died July 23 whenhis vehicle was struck by an improvised explosive device while conducting combat operations near Ar Rutbah, Iraq. He was assigned to 2nd Light Armored Reconnaissance Battalion, 2nd Marine Division, II Marine Expeditionary Force, Camp Lejeune, N. C.
Present Bush visited the Egyptian Embassy here today to express his sympathy for those lost in the deadly July 23 attacks and to sign their condolence book. President Bush also condemned the attacks on Egypt's Sharm el-Sheikh resort area, pointing to them as another example of the need for the international community to unify in the global war on terror. Secretary of State Condoleezza Rice, who was traveling in Jerusalem the day of the bombings, reiterated the White House message that the United States will support Egypt as it confronts its most deadly terrorist in its history. "Together, we will confront and defeat this scourge that knows no boundary and respects no creed," she said. "This operation came as part of the response against the global evil powers which are spilling the blood of Muslims in Iraq, Afghanistan, Palestine and Chechnya… The mujahedeen-- have dealt a devastating blow to the Crusaders and the Zionists and the infidel Egyptian regime in Sharm al-Sheikh." Cpl. Steven P. Gill, 24, of Round Rock, Texas, died July 21 from an improvised explosive device while conducting combat operations near Zaidon, Iraq. He was assigned to the Marine Reserve's 4th Reconnaissance Battalion, 4th Marine Division, San Antonio, Texas. During Operation Iraqi Freedom his unit was attached to Regimental Combat Team-8, 2nd Marine Division, II Marine Expeditionary Force. This is what an Advertisement looks like that Time has going on right now-- And I thought it was only about that mean old Carl Rove person!!! Petty Officer 3rd Class Travis L. Youngblood, 26, of Surrency, Ga. , died July 21 of wounds received July 15 from an improvised explosive device during combat operations in Hit, Iraq. Youngblood was a hospital corpsman assigned to Naval Hospital Great Lakes, Great Lakes, Ill. , and deployed with the II Marine Expeditionary Force. DoD (DPMO) Identifies a U. S. serviceman, missing in action from the Korean War. The Department of Defense POW/Missing Personnel Office (DPMO) announced today that the remains of a U. S. serviceman, missing in action from the Korean War, have been identified and are being returned to his family for burial with full military honors. He is Cpl. Leslie R. Heath, of Bridgeport, Ill. His interment is scheduled for Aug. 20 in Bridgeport. On the morning of April 23, 1951, Heath and more than 80 members of 'A' Company, 1st Battalion, 5th Regimental Combat Team were captured by Chinese Communist forces. They were held in a temporary POW camp known as Suan Camp Complex, in North Hwanghae Province, North Korea. A former American POW who was returned to the U. S. through Operation Little Switch recounted that Heath died in June 1951 while imprisoned. On July 16, 1993, the Democratic People's Republic of Korea returned 17 boxes of remains to the United States from the Korean War. One of the boxes contained remains of several individuals and two of Heath's identification tags. Scientists of the Joint POW/MIA Accounting Command (JPAC) conducted years of forensic examinations of the remains and associated evidence until they made an identification two months ago.Information provided by the North Koreans about the recovered remains was consistent with the approximate location where Heath was believed held captive and died. Artifacts in the boxes were those of a soldier in the U. S. Army infantry at the time of the war. JPAC submitted skeletal remains on 11 occasions to the Armed Forces DNA Identification Laboratory for analysis. Heath's mitochondrial DNA sequence matched that of two of his maternal relatives. Of the 88,000 Americans unaccounted for from World War II, the Korean War, the Cold War, the Vietnam War and Desert Storm, more than 8,100 are from the Korean War. More than 2,000 of those were held as prisoners of war. For additional information on the Department of Defense's mission to account for missing Americans, visit the DPMO Web site at http://www.dtic.mil/dpmo or call (703) 699-1169. Sgt. Arthur R. McGill, 25, of Gravette, Ark. , died July 19 in Baghdad, Iraq, where an improvised explosive device detonated while he was on mounted patrol in a HMMWV. McGill was assigned to the 1st Battalion, 9th Field Artillery Regiment, 2nd Brigade Combat Team, 3rd Infantry Division, Fort Stewart, Ga.
Can you help the police identify the bombers? Staff Sgt. Jefferey J. Farrow, 28, of Birmingham, Ala. , died July 19 in Camp Arifjan, Kuwait, of non-combat related injuries. Farrow was assigned to the Army Reserve's 146th Quartermaster Company, Fort Totten, N. Y.
UK, Australian leaders vow attacks won't sidetrack Terror War Support. Based on a Pentagon report, US Secretary of Defence Donald Rumsfeld on Wednesday said rebels will carry out effective attacks on Iraqis, adding that terrorists remain effective, adaptable, and intent on carrying out attacks on Iraqi civilians and Iraqi officials. U.S. Army Sgt. Jeff McGee gives a hug to local Iraqi girls as his squad patrols near Nasiriya in southern Iraq, on July 17, 2005. McGee is deployed with Bravo Company, 2nd Battalion, 142nd Infantry Regiment. "Had the world paid attention to Afghanistan at that time, from 1993 to 2001, perhaps we would have had the Twin Towers standing; perhaps today we would not have had the bombings in London-- and other parts of the world." First manned Moon Landing 36 years ago today- July 20, 1969. More than 2000 troops will be going to Afghanistan, thanks to NATO, to help in the security of the upcoming elections this September. After all the new troops are deployed, there will be a total of 11,400 troops from NATO with most coming from Spain, Italy, Canada, Turkey and Germany. Read more at: International Herald Tribune. Pvt. Lavena L. Johnson, 19, of Florissant, Mo. , died July 19 in Balad, Iraq, of non-combat related injuries. Johnson was assigned to the Army's 129th Corps Support Battalion, Fort Campbell, Ky. This is a follow-up on a post I did earlier called "Allah Akbar - Allah Akbar." With this said I’ll ask you to click on 'Jack Army' for a real good read on a very brave and lucky Soldier… What say you??? Spc. Ronnie D. Williams, 26, of Erlanger, Ky. , died on July 17 in Baghdad, Iraq, of injuries sustained on July 16 in Baghdad, Iraq, when his M1A2 Abrams tank left the road and entered a canal during patrol operations. Williams was assigned to the 3rd Squadron, 3rd Armored Cavalry Regiment, Fort Carson, Colo.
Sgt. 1st Class Ronald T. Wood, 28, of Cedar City, Utah, died July 16 in Kirkuk, Iraq, when an improvised explosive device detonated near his HMMWV. Wood was assigned to the Army National Guard's 148th Field Artillery, Brigham City, Utah. Staff Sgt. Jorge L. Pena-Romero, 29, of Fallbrook, Calif. , died July 16 in Baghdad, Iraq, when an improved explosive device detonated near his HMMWV while his unit was conducting a mounted patrol. Pena-Romero was assigned to the 1st Squadron, 11th Armored Cavalry Regiment, Fort Irwin, Calif.
Lance Cpl. Efrain Sanchez, Jr. , 26, of Port Chester, N. Y. , died July 17 as result of a non-hostile incident at Camp Blue Diamond, in Ramadi, Iraq. He was assigned to Headquarters Battalion, 2nd Marine Division, II Marine Expeditionary Force, Camp Lejeune, N. C.
Staff Sgt. Frank Tiai, 45, of Pago Pago, American Samoa, died July 17 in Baghdad, Iraq, when an improvised explosive device detonated near his position. Tiai was assigned to the Army Reserve's 100th Battalion, 442nd Infantry, Fort Shafter, Hawaii. Cpl. Clifton B. Mounce, 22, of Pontotoc, Miss. Cpl. Christopher D. Winchester, 23, of Flomaton, Ala. Both Marines died July 14 when their vehicle was struck by an improvised explosive device while conducting combat operations near Trebil, Iraq. They were assigned to 3rd Battalion, 10th Marine Regiment, 2nd Marine Division, II Marine Expeditionary Force, Camp Lejeune, N. C.
During Operation Iraqi Freedom they were assigned to 2nd Light Amored Reconnaissance Battalion, Regimental Combat Team-2, 2nd Marine Division, II Marine Expeditionary Force. Media with questions about these Marines can call the 2nd Marine Division Public Affairs Office at (910) 451-9033. We’ve all seen them on different websites. Those cute little ‘$.00’ counters running up the cost of the war with Iraq… Or how about those Body Count counters??? I’m sorry but every time I see one of those “@#&*” things it just makes me flat out SICK!!!!!!! Sgt. Travis S. Cooper, 24, of Macon, Miss. , died on July 16, in Balad, Iraq, from wounds sustained the previous day in Baghdad, Iraq, when an inprovised explosive device exploded near the vehicle he was searching. Cooper was assigned to the Army National Guard's 2nd Battalion, 114th Field Artillery Regiment, Starkville, Miss. Spc. Jared D. Hartley, 22, of Newkirk, Okla. , died July 15 in Taji, Iraq, when an improvised explosive device detonated near his HMMWV. Hartley was assigned to the 125th Forward Support Battalion, 3rd Brigade, 1st Armored Division, Fort Riley, Kan.
Staff Sgt. Tricia L. Jameson, 34, of Omaha, Neb. , died on July 14 in Trebil, Iraq. Jameson, a health care specialist was responding to a casualty incident when a secondary improvised explosive device detonated near her location. Jameson was assigned to 313th Medical Company, Army National Guard, Lincoln, Neb. Pfc. Timothy J. Hines, Jr. , 21, of Fairfield, Ohio, died on July 14 at the Walter Reed Army Medical Center, Washington, D. C. , from wounds sustained on June 19 in Baghdad, Iraq, when an improvised explosive device detonated near his HMMWV. Hines was assigned to the 64th Military Police Company, 720th Military Police Battalion, 89th Military Police Brigade, Fort Hood, Texas. MoveOn.org has finally updated their BS Site!!! The first nuclear explosion in history took place in New Mexico, at the Alamogordo Test Range, test name “Trinity” on July 16, 1945. Hat tip to 'warriorsvoice' Good read and thanks for aiming us to this video. I could be wrong but something seems completely wrong with the following DoD Press Release. Help me out here-- What say you??? 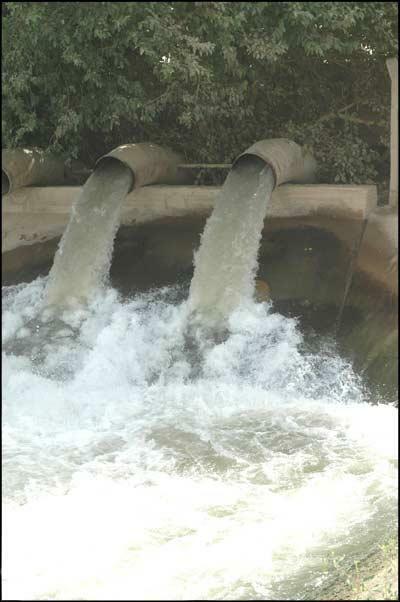 officials said in a statement. The charges are related to a report by a Task Force Baghdad soldier that other soldiers had allegedly assaulted suspected terrorists. 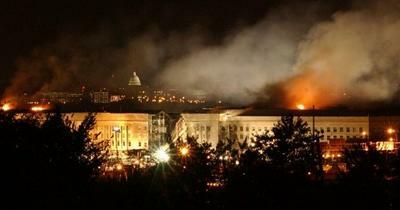 The Army's Criminal Investigation Division immediately began an investigation into the incident, officials said. Few details of the alleged assault are available. Officials said specifics couldn't be released until the cases have been resolved. However, they said none of the suspected nsurgents required medical treatment after the alleged assault, and only one remains in custody. "All Task Force Baghdad soldiers are expected to act appropriately and to treat all persons under their control with dignity and respect. Allegations of illegal activities will always be thoroughly investigated," Army Lt. Col. Clifford Kent, a Task Force Baghdad spokesman, said. "The unit involved has been pulled 'off-line' to complete the inquiry and retraining." "Israel will not withdraw from the Gaza Strip under Palestinian fire. If the Palestinians continue to shoot, Israel will deal with their terrorism right now and proceed with the pull-out later." The Department of Defense POW/Missing Personnel Office (DPMO) announced today that the remains of four U. S. servicemen, missing in action from the Vietnam War, have been identified and are being returned to their families for burial. Lt. Col. Marvin L. Foster, Hubbard, Tex. Sgt. 1st Class Raymond E. Bobe, Tarrant, Ala.
On March 16, 1969, Capt. Smith was piloting an Army U-21A "Ute" aircraft with Foster, Batt, Bobe and one other passenger aboard whose remains have not been identified. The aircraft left Qui Nhon airfield in South Vietnam, headed for Phu Bai airport near Hue. The Da Nang control tower briefly established radar and radio contact, but was unable to maintain it. The aircraft never landed at the Phu Bai airport. Combat search and rescue units scoured the area, both land and sea, for the next eight days, but did not find the missing aircraft. In 1988 and 1989, the Vietnamese government turned over to U. S. specialists several boxes of human remains, including identification tags for Bobe and Smith. The technology at the time failed to yield an identification of the remains. Also in 1989, a Vietnamese refugee in the Philippines was interviewed, and turned over human remains as well as a rubbing of an identification tag for Bobe. U. S. specialists from the Joint POW/MIA Accounting Command (JPAC) conducted seven investigations between 1993 and 1999, to include interviews with Vietnamese nationals who claimed to have knowledge of the crash. Then in April and May of 2000, a JPAC team excavated an area about 25 miles northwest of Da Nang, where they found aircraft debris and human remains. Of those Americans unaccounted for from all conflicts, 1,827 are from the Vietnam War, with 1,393 of those within the country of Vietnam. Another 756 Americans have been accounted for in Southeast Asia since the end of the Vietnam War. Of the Americans identified, 528 are from within Vietnam. None existed prior to Mar 03. ·There are over 168,000 internet subscribers. The estimated pre-war level is 4,500 subscribers. ·More than 149,000 Iraqis are currently being employed by USG projects. ·The Iraqi Stock Exchange opened in June 2004. It currently lists 89 companies (up from 40-50 under Saddam) with a total market capitalization of $1.4 billion. Between $2-6 million in shares are traded daily. ·In Oct 2004, 4.3 million children were enrolled in primary school-up from 3.6 million in 2000. ·Since Mar 2003, over 5 million Iraqi children aged 6-12, over 3 million children under 5, and over 700,000 pregnant women have received vaccinations. Info from: U.S. Central Command Electronic Newsletter. Magdy Elnashar, 33 years old and a chemistry student at Leeds University was detained near Cairo, Egypt and was being questioned. 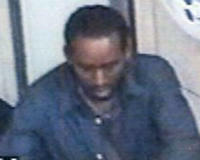 Elnashar was believed to have had a central role in the making of the bombs used in last week’s bombings in London. 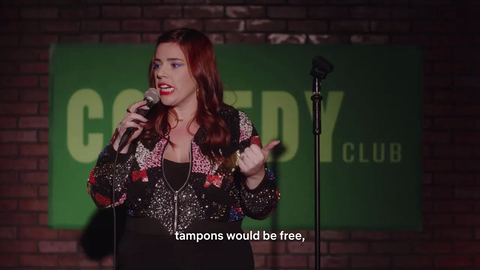 AubreyJ says- No…. Fire Wilson!!! Now I for one can not wait till the next round of elections come up just so I can watch the media and many on the left, mope around in shell shock trying to figure out how in the world it happened to them again. They just don’t get it!!!!!!!! Spc. Benyahmin B. Yahudah, 24, of Bogart, Ga. , died on July 13 in Baghdad, Iraq, where a vehicle borne improvised explosive device detonated near his dismounted patrol. Yahudah was assigned to the 1st Battalion, 64th Armor Regiment, 2nd Brigade Combat Team, 3rd Infantry Division, Fort Stewart, Ga. Sometime in early 2006, 14 out of 18 provinces could be handed over to Iraqi control, allowing for a reduction in the overall U.S. troops to around 66,000. If I’m correct, at this time we now have around 138,000 troops in Iraq. Sgt. Timothy J. Sutton, 22, of Springfield, Mo. , died on July 11 in Baghdad, Iraq, where his HMMWV struck a land mine. Sutton was assigned to the Army's 3rd Squadron, 3rd Armored Cavalry Regiment, Fort Carson, Colo.
Pfc. Eric P. Woods, 26, of Omaha, Neb. , died on July 9 in Tal Afar, Iraq. His HMMWV struck an improvised explosive device that caused the vehicle to overturn. 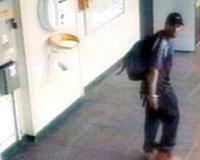 Woods was in the area to evacuate another soldier who had been wounded. Woods was assigned to the 2nd Squadron, 3rd Armored Cavalry Regiment, Fort Carson, Colo.
Lance Cpl. Kevin B. Joyce, 19, of Ganado, Ariz. , died June 25 after falling into the Pech River while conducting combat operations in Afghanistan. He was assigned to 2nd Battalion, 3rd Marine Regiment, 3rd Marine Division, III Marine Expeditionary Force, Kaneohe Bay, Hawaii. For further information related to this release, contact the Marine Corps Base Hawaii Public Affairs Office at (808) 257-8840 or mailto:pao@mcbh.usmc.mil. Spc. Hoby F. Bradfield Jr. , 22, of The Woodlands, Texas, died July 9 in Tal Afar, Iraq while he was conducting a dismounted cordon search. Bradfield was assigned to the Army's 2nd Squadron, 3rd Armored Cavalry Regiment, Fort Carson, Colo.
A visual presentation of the major al Qaeda attacks, since the creation of the International Islamic Front and their subsequent declaration of war back in February of 1998. Petty Officer 2nd Class Matthew G. Axelson, 29, of Cupertino, Calif, died while conducting counter-terrorism operations in Kunar province, Afghanistan. Coalition forces located the service member while conducting a combat search and rescue operation July 10 in Kunar province. Axelson was assigned to SEAL Delivery Vehicle Team ONE, Pearl Harbor, Hawaii. For further information related to this release, contact Naval Special Warfare Command Public Affairs at (619) 437-5133. Staff Sgt. Joseph P. Goodrich, 32, of Allegheny, Pa.
Lance Cpl. Ryan J. Kovacicek, 22, of Washington, Pa. Both Marines died July 10 from enemy indirect fire while conducting combat operations in Hit, Iraq. They were assigned to Marine Forces Reserve's 3rd Battalion, 25th Marine Regiment, 4th Marine Division, Moundsville, W. Va. During Operation Iraqi Freedom their unit was attached to Regimental Combat Team-2, 2nd Marine Division, II Marine Expeditionary Force. This Army airborne infantry battalion, will be going to Afghanistan to help provide more flexibility in the fight against terrorism and to help in the support of the National Assembly and Provincial Council elections coming up this September 18th. 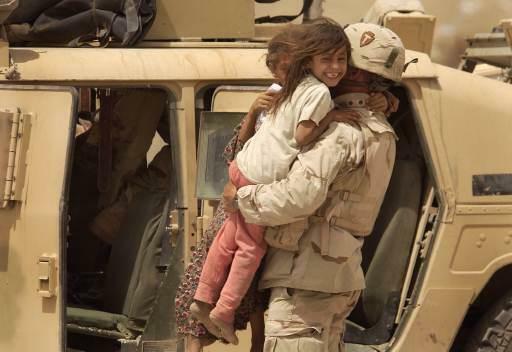 I wish all the troops and their families nothing but good things… For the troops to have a safe and successful mission and for all of them to return home soon after the elections. *** The body of the final member of a Navy Seal counterterrorism team was recovered during combat-search-and-rescue operation on July 10th in the Kunar province of Afghanistan military officials said today. Sgt. Deyson K. Cariaga, 20, of Honolulu, Hawaii, died on July 5, in Al Hammadi, Iraq, when the HMMWV in which he was riding struck a land mine. Cariaga was assigned to the Army National Guard's 229th Military Intelligence Company, 29th Separate Infantry Brigade, Oahu, Kalaeloa, Hawaii. The relative calm in Iraq couldn’t last forever. Today, (Sunday,) a suicide bomber blew himself up at a Baghdad Army Recruiting Center, (filled with recruits,) killing himself and at least 25 others and wounding as many as 47 more. SECURITY COUNCIL CONDEMNS ASSASSINATION OF EGYPT’S AMBASSADOR TO IRAQ, REAFFIRMS SUPPORT FOR POLITICAL TRANSITION, IN PRESIDENTIAL STATEMENT. The league of CUT and RUN NATIONS condemning anything is a great big JOKE in my book!!!!!! I just noticed that it’s been two days now and DoD has not sent out one single Casualty Press Release. After looking back over reports from DoD and other news sources, I see where none of our Military personnel have been killed in the last few days either. It’s just been quite these last few days in Iraq and no one has said anything about it!!! Well… We did have the murder of Ihab el-Sharif, who was Egypt's Ambassador to Iraq just yesterday but other than that-- Quiet Time in Iraq and Afghanistan. What about suicide bombers you ask… Sir Iran Blair said today, “We have absolutely nothing to suggest this was a suicide bombing attack although nothing at this stage to rule that out.” As far as unexploded bombs go… Blair said that only the four exploded terrorist bombs were found, no others, yet two suspicious packages were destroyed by police in controlled explosions but they turned out to be harmless. ** Prince Charles, his new wife Camilla and Queen Elizabeth have all visited St Mary’s Hospital in Paddington. They spent time visiting with many of the attack victims who had been taken there yesterday. ** No one is saying for sure as to who did these attacks in London yesterday but these attacks sure do have the hallmarks of al-Qaeda written all over them. A group called ‘The Secret Organization of al-Qaeda in Europe’ posted a message right after the attacks yesterday taking full responsibility. British Police say this group is of high interest to them right now but suggest nothing more. (Note: Al- Zarqawi is thought to have operated under a number of different names in Iraq. He’s used such names as ‘al-Qaeda Between Two Rivers’ and ‘al-Qaeda in Iraq’. Hint a potential connection between Zarqawi and ‘The Secret Organization of al-Qaeda in Europe’.) 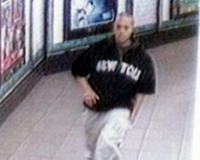 Another group today also claimed responsibility for the attacks. Not sure what the name of this group is but I do know that no one is giving them very much attention. ** After arriving back in Washington DC from his G8 Summit Meeting this afternoon, President Bush went straight to the British Embassy and signed the book of condolences. "There are obviously casualties, both people who have died and people who are seriously injured, and our thoughts and prayers, of course, are with the victims and their families." President Bush condemned today's coordinated terrorist attacks in London and instructed U. S. Department of Homeland Security officials to encourage local and state officials to be "extra vigilant" to prevent similar attacks in the United States. ** After four explosions in London this morning, Homeland Security raises Terror Alert Level for MASS TRANSIT SYSTEMS, (Rail, Bus and Subway systems,) throughout the United States. No changes for airlines at this time. No specific intelligence indicating this type of attack in London is seen in the United States at this time. This morning, terrorists apparently set off bombs in three London subway cars and one double-decker bus. This is by far the worst attack in London since World War II. During press conferences today, an obviously shook up Tony Blair tries to comfort the British people. Tony Blair returns to London from Scotland where he had been attending a conference of leaders from major industrialized nations. (The G8 Summit…) All of Britain’s Subway and Bus systems are shut down today. As many as 700 people injured in London Blasts. No one knows who was responsible for these attacks, yet it does have the earmarks of an Al Qaeda attack. 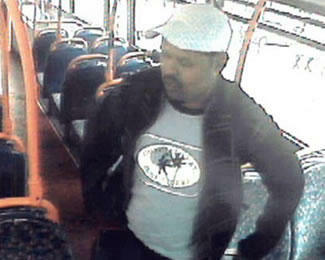 One bus may have been blown up by a suicide bomber at Russell Square in central London. More on this as information becomes available. ** Wall Street acts with calm over Terrorist Attacks in London today. Oil at $60.73 which is off from the earlier record highs of $62.10 set earlier in the day. ** The jailing of a New York Times journalist Judith Miller, who refused to testify in an investigation into the reviling of a CIA agent back in 2003, gets “0” Press today. Also today the Egyptian presidency confirmed the murder of Ihab el-Sharif, who was Egypt's Ambassador to Iraq. It was 4 days ago when Sharif was kidnapped in Baghdad by the al-Qaida group of Iraq. Very little press has been given to this murder either. ** Earlier today at the British Embassy here in the States, Secretary of State Condoleezza Rice said the attacks will only re-energize efforts to counter terrorism. "It will, in fact, only strengthen the resolve of Great Britain, of Prime Minister Blair and his government, and of the people of Great Britain to make certain that terrorists know that they cannot win," she said. "We remain resolved in our determination to root out this scourge against humanity and against civilization." Secretary Rice also expressed America's "deepest sympathies and our solidarity" to the people of Great Britain. 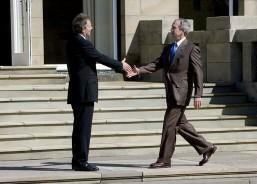 ** After being back in London for 8 hours, Tony Blair returns to Scotland and the G8 Summit.